I’ve been wanting to write a post about Pontypool for some time now, and I’ve put it off because a) I’ll never do the damn thing justice with my ramblings and b) procrastination FTW! But it’s time I at least brought it to the attention of everyone I know who loves zombies because, seriously, you have not seen zombies like this before. Writers and filmmakers have tried to freshen up zombies in a variety of ways, and I don’t mean by hanging those little cardboard pine trees from their ears, although that would be hilarious and needs to be filmed immediately. They’ve made it a about speed, science, or just coming up with different reasons people might have for craving the brains of other people, which are probably delicious with the right sauce. But as far as I’m aware, no one has ever made zombies about LANGUAGE. In this version of (non)zombie lore, certain words are infected and using them leads to stuttering, confusion of meaning, confusion of sounds, just… confusion in general. And then you try to eat through other people’s mouths in order to steal their words. Ya got that? It’s not about getting their brains. You eat their faces in order to steal their language, in the most physical way possible. The entirety of the film takes place in a church basement/radio station with a relatively tiny cast. Anything outside the basement is experienced through aural avenues. On the surface, it doesn’t sound like an interesting watch, but believe me, it is. If you had told me, after I watched this film for the first time, that the cameras rarely left the basement, I wouldn’t have believed you. It just doesn’t feel that limited. At all. The actors do an amazing job of convincing you that the world outside is real, that the community suffering from this new kind of disease is far from fictional. After I saw the film, I tried to learn more about it and discovered it was originally a novel called Pontypool Changes Everything by Tony Burgess. I started reading the first few pages and had to quit. It gave me flashbacks of Ben Marcus’ The Age of Wire and String, which I recall thinking was kind of brilliant, at first, until the innovation overwhelmed me. I just couldn’t stick with it because everything in it meant so little to me, and I fear Pontypool Changes Everything would have the same effect. This may be one of those rare times when the movie does more for me than the book. I think the actors really sold this one—really, really sold it. So if you’re looking for a truly different take on the whole zombie fad that seems to be happening right now, give Pontypool a look. It’ll make you think, but not at the cost of the story. It challenges the boundaries of its genre without ignoring them completely. It is absolutely worth a watch, if only to discus what the hell was going on with that out-of-nowhere ending. I just found out Doctor Who is back on the air! That’s how out of touch I’ve been. I missed it, and I’m probably going to miss some more because THINGS ARE HAPPENING. My life could change dramatically very soon in so many different ways, and it all comes down to just a few factors. For this reason, I’ve been in high-anxiety mode. When I’m not running around trying to figure things out and get things done, I’m busy fighting insomnia. So I haven’t been blogging, I haven’t been tweeting, I haven’t been very active on Goodreads or DeviantArt, and I’m sorry. One thing I have been doing is working to get my books to a wider audience. You may have noticed Chemistry, my contemporary YA retelling of Victor Hugo’s The Hunchback of Notre-Dame, has been having a bit of a coming-out party in the form of a free e-book event. It was nurtured and sheltered by Amazon for its first several months in the world, and now it’s time for the little book to grow up and meet new vendors like Kobo and Barns & Noble. Maybe even iBooks, if iBooks is sweet. If you missed the first few days of Chemistry‘s event, don’t fret. You can still grab the book for free at Amazon all day today and tomorrow. Please do, in fact! Compared to Titan Magic, Chemistry has been kind of an odd duck—a socially awkward, shy little book. It needs to get out there and dance with new readers. And I need to get my life in order so I can sit down and have a very serious Doctor Who marathon night. Are Ghost Stories Our Modern Fairy Tales? Fairy tales, as I understand them, are a specific form of folklore. They’re the product of oral storytelling, the passing on of tales, the slow metamorphosis of stories as each person adds and omits details. It’s kind of a lost art, really. These days, we have television and books to give us our stories. We use words like canon to discuss which parts of the story are original or correct. Community composition seems limited to gossip. But I recall telling stories from memory when I was a child. I recall going to slumber parties and having competitions to see who could terrify everyone else the most. One of my earliest memories is of my father telling my sister and I ghost stories while we were camping. So it isn’t totally gone, this human habit. We just don’t call it folklore any more, even though it is. And these stories aren’t all that different from the fairy tales we used to tell. Sometimes there’s magic. Sometimes there isn’t. But there’s always something unusual, something twisted and menacing. There’s always something horrible to drive the story, the moral, the memory home. So, in honor of Fairy Tale Fortnight, I’d like to tell you one ghost story I’ve never been able to purge from my head. I’ll tell it as I remember it, without looking up a “canon” version because, to me, that’s part of what makes folklore Ours and not Someone Else’s. 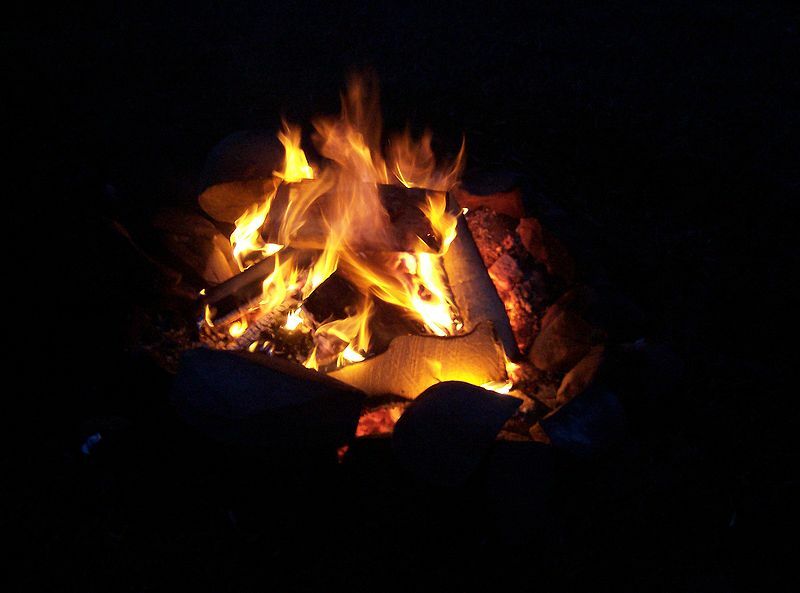 Warning: The rest of this post contains a campfire story… a scary campfire story. Once upon a time, there was a girl—a “latchkey kid,” as my mother would call her—who came home from school every day to a lonely house. The only company she had until her parents got back from work was the family dog: a huge, slobbery mutt she loved more than anything in the world. Now this girl was a nervous sort, afraid to open her front door before she’d been reassured that all was well inside. So every day, she would hold her hand through the dog door and wait. Eventually, her canine companion would lick her hand, assuring her that everything was as it should be. Then she’d turn her key and enjoy the rest of the afternoon. One day, after receiving the telltale hand-lick, she opened her door and found an eerily quiet house. There were no giant paws ticking on the tile floor, no wet nose sniffing her pockets for treats, no floppy-eared head nudging her hand for affection. All she could hear was a steady drip, drip, drip, like a faucet was leaking somewhere in the house. She checked the sink in the kitchen, but it wasn’t leaking. Still she heard the drip, drip, drip. She checked the bathroom, and all was well. But now the sound was louder: drip, drip, drip. Finally, she gave up and went into her bedroom. There, on her desk by the window, she found a bowl filling, drop by drop, with the blood of her beloved dog hanging dead from the ceiling. But in her shock, horror, and escalating fear, only one question haunted her. Who (or what) had licked her hand through the dog door. The first time I heard the story called “Drip, Drip, Drip” among slumber-party goers, I stayed up all night tearing paper cups into confetti. It absolutely horrified me, even though I couldn’t exactly articulate why. Now I think it’s a combination of my protectiveness toward animals, the descriptive use of sound, and the unresolved mystery. I can analyze the story and see some typical folklore tendencies: the pattern of three (three drips; three rooms entered), the cautionary moral (beware entering a lonely house, and don’t always trust your safety to one factor), and the corruption of the familiar in order to create horror. All these things came together to make a nightmare of a tale for little, impressionable me. So that’s my campfire story for you. I wish I could remember more of them. I’ve only hung on to a few, but this one really stuck with me, possibly because it uses the fairy tale patterns so well, despite its not being what one would generally consider a fairy tale. I don’t know where it came from, only that it spread like wildfire when I was a child. It was always a hit when I told it, too, and I was happy to pass on the nightmares it gave me. I hope this brought back some memories for some of you. If you like, tell me a campfire/slumber party story you remember from your childhood in the comments. Let’s keep the tradition alive!